Your resume, regardless of the position you are applying for, is the most powerful marketing tool that you have when embarking on a new job. It is important to have a concise and well-written resume, not something that reads like a shopping list of your previous work experiences. Remember that many other people are applying for the same position. The hiring manager won’t see your face, won’t hear your voice, and won’t call you for an interview without first being impressed by your resume. The health care field, especially nursing, is in high demand, but that doesn’t mean that a poorly written resume will still get your foot in the door. The following suggestions will help you to write a resume that will get you to that next crucial step – the first interview. 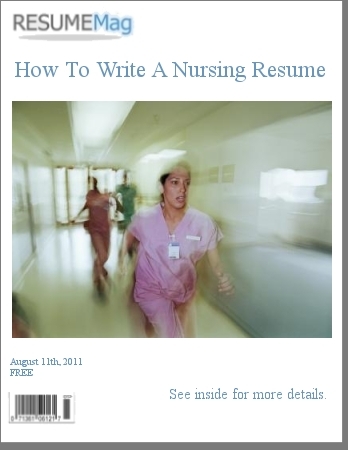 What is different about a nursing resume? A nursing resume is very similar to a standard resume in most respects, with the exception that your specific skill set and education will pertain to the health care field. You will want to ensure that your resume reflects the latest trends and terminology of the health care industry while demonstrating the depth of your knowledge, skills and experience. Patience: Dealing with ailing or injured patients, panicking or demanding relatives, takes more patience than most jobs. Attention to detail: You are most likely going to be keeping track of multiple medications for multiple patients and relaying other critical details for nurses on the next shift. Stamina: At the end of an eight or twelve hour shift, you need to still have patience and attention to detail – and a nurse’s legs can get pretty tired, being on your feet for most of that time. Love: Okay, that word sounds way too touchy-feely for a resume, but you do need to get across that you care about the patients and their family, because that is a big intangible in the field of nursing. What needs to be emphasized in the resume? When applying for a new job, your resume only has a few seconds to grab the attention of the person who is in charge of narrowing down the list of potential candidates from the hundreds, if not thousands of resumes that were submitted. The place to grab their attention and draw them into the rest of your resume is located just below your contact info. This is the area that needs to be emphasized in your resume. Here you will write a brief, professional summary in a narrative format that establishes the essential claims as to why you are suitable for the job, and gives a good sense of your character. The remainder of your resume should be comprised of proof that helps to back up every claim you made in the professional summary, and every hint of your personality traits. What qualities need to be expressed? Many nurses, whether they are veterans of the career or fresh out of college, all have one thing in common, and that is the mistaken belief that potential employers will immediately recognize the amount of responsibility that is linked to their job title. When describing previous health care experience, specific qualities and details should be explained to help the hiring manager understand your qualifications and how you excelled in those positions. Such things describing the size of the facility, speciality of the unit and number of patients will go a long way to helping the potential employer understand what you are capable of. Remember that anyone you are competing against also can post titles. Think about what makes you stand out, how you excelled, how you gave superior care, how patients and families reported positive experiences on account of your efforts. Your resume should also include any licenses and other nursing certifications that you have obtained. If you ended up with a good score on the NCLEX exam, you may also want to include that on your resume. Who do you need to target? When submitting your resume you should target as many different parts of the health care system as skills will allow you. Just because you want an ER positions does not mean you will get it right away. So keep your skills sharp and take a position somewhere else while you wait until one opens in the ER. Keep in mind that all the above advice must be adjusted according to the type of position you seek. For instance, when applying for an ER position or even an OR or ICU position, you’ll need to demonstrate clearly that you have proven to exercise sound judgment and keep performing to 100% under stress. For a position in a nursing home, you will need to emphasize more the empathic, caring side. A professional resume writer can help you answer these questions in the eyes and minds of the hiring manager. With a professionally written nursing resume, and possibly the help of a health care recruiter, your possibilities can be endless, from hospitals to nursing homes, private clinics and anywhere in between. Tags: caring, detail, er, experience, icu, nurse, nursing, nusring home, or, patience, patients, resume, stamina. Copyright by resumeservicesonline.com. All rights reserved.